Because after looking at it, Pop! Goes my heart! 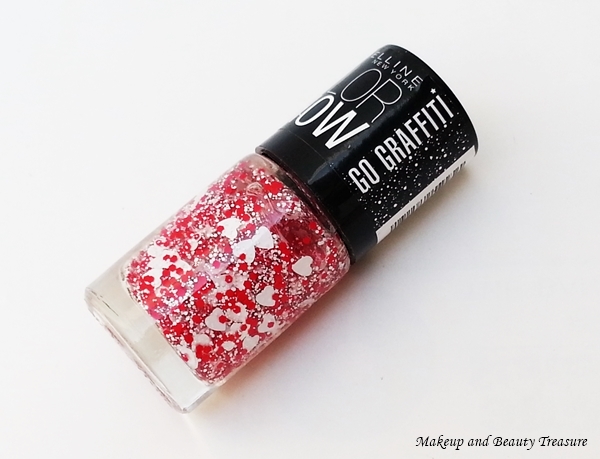 Maybelline Color Show Go Graffiti Nail Polish is one such range that I totally adore and I would highly recommend it to all girls who love decorating their nails but are not so good in nail arts. These top coats instantly make your nails look chic and glam! After buying Maybelline Color Show Go Graffiti Nail Polish in Red Splatter and Maybelline Color Show Go Graffiti Nail Polish in Unmellow Yellow, I recently picked up Maybelline Color Show Go Graffiti Nail Polish in Pop Goes My Heart. Thoughii keep changing my nail polishes and designs but this top coat is so girlie and romantic that I used it consecutively for the last 3 weeks! It is priced at Rs 145 and you can BUY ONLINE HERE at an offer price! The nail polish is small and cute! Here is the shade number and name! If you want a detailed post regarding this range then visit this post HERE. Pop Goes My Heart is a clear top coat with lots of white and red chunks. 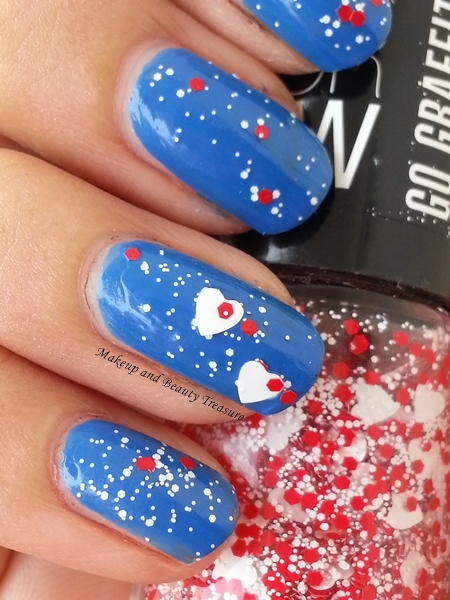 The red chunks are hexagonal and this nail polish also contains white hearts that makes it perfect romantic date polish! As much as I wanted to use it on black nail polish, I could not resist myself from applying it over blue nail polish. All you need is a single coat of Maybelline Color Show Go Graffiti Nail Polish Pop Goes My Heart over your base polish and you are ready to flaunt your nails for at least 5-6 days and more if you do not do household chores. I had applied it over at my in laws place (i stayed there for 10 days) and it was fresh and good till I returned to my home! The nail polish is a bit difficult to remove but removing it with Hiphop Nail Polish Remover Wipes makes the task easy! - Lasts for at least 5-6 days without chipping. - Looks beautiful on dark nail polishes! 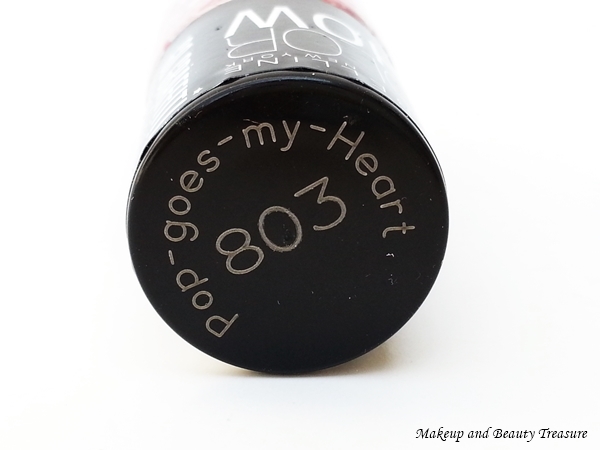 Maybelline Color Show Go Graffiti Nail Polish in Pop Goes My Heart is my to-go-to nail polish. I loved it the core for its look, longevity and formula. It is value for the money and I would highly recommend it to all nail polish lovers! - It looks best with black and blue nail polishes but you can always go creative with colors! What is your favorite Maybelline Color Show Go Graffiti Nail Polish? I would love to see yours! Thank you! Loved this Graffiti nail paint.The heart shaped pieces are so cute.Nice NOTD. I love maybelline go graffiti collection.